Canadians, as a people, have regularly been hailed for their individual and collective generosity, their giving spirit and quickness to lend a helping hand via either donations or deeds. That's undoubtedly a wonderful thing to be celebrated for. And hopefully, it continues to bear fruit in the form of generous future generations. We are quick to build schools in Africa and elsewhere, assist in digging holes to establish the infrastructure to allow clean running water to flow freely in impoverished foreign villages, clothe, feed and empower compromised, war-torn and/or devastated communities the world over. These are great, noble pursuits. Still, I've always wondered: Why can't we harness that helpfulness, channel that compassion, and steer it towards our own backyard? How can any of us in Canada continue to live with the living conditions that the majority of the founding fathers of this country continue to endure -- in 2016. 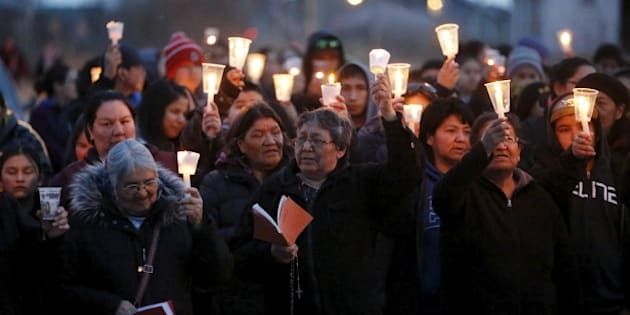 Two federal ministers will visit the reeling First Nations community of Attawapiskat, in a remote portion of Northern Ontario, this week -- reeling because of an unfathomable number of recent suicide attempts, many among their future generation: their youth. The numbers are sobering and should affect us all -- 28 people tried to take their own life in March, 11 so far in April, including five in one evening -- and the month is only at the halfway point. I can tell you first-hand of the deplorable conditions afflicting many of our aboriginal neighbours -- and the communities I visited were not that remote. Let us be clear, there is no overnight fix here. I will submit though that many of the debilitating challenges on First Nations reserves come in the form of infrastructure -- access to clean running water, proper and plentiful housing, to name only two. With all the money that is now earmarked for infrastructure by the Trudeau government, it would seem logical that this issue should be able to be addressed within this James Bay community and other First Nations communities across the country -- provided there is a plan and accountability attached to it. Having visited a few First Nations reserves during my time as a news reporter at CTV, I can tell you first-hand of the deplorable conditions afflicting many of our aboriginal neighbours -- and the communities I visited were not that remote. This absolutely should not be tolerated by any of us. If we can be moved to action watching footage of children living in poverty in third-world countries, we should be equally driven to effect change when we see the inhumane conditions that exist for our First Nations communities across the country. One of the challenges has and will continue to be transparency and accountability of the government money that does make it to these communities. Does it get tangled up in red tape and bureaucracy or does it trickle down? One of the solutions, it would seem to me, is to have the media play a role as an objective third party. This would involve regular, consistent reporting from different communities across the country about the progress of infrastructure projects -- part investigative journalism, part big brother reporting -- all of it necessary as the media has the ability to access the key parties, get to the main spokespeople and describe or show progress or lack thereof. That, in my opinion, has been the key missing link to truly addressing this sadly, long-mishandled file. The pattern so far has been that media will descend on a story (suicide, death by substance abuse or alcohol, some other kind of mass fatality) on a reserve. The story will be part of the headlines for a day or two. Then it vanishes, while the problems for these communities quietly spiral with no spotlight. Then a few months down the road, another fatality (e.g. La Loche, Saskatchewan). Media glare, prime minister visits, headlines for a day -- then gone, again. When a young person makes the decision that their life is so meaningless and unimportant that they have no choice but to end it -- one can probably trace the overriding symptom back to one thing: a lack of hope. When a parent has been the victim of the residential school crisis and is haunted by that experience with their own children, the hopelessness moves from one generation to another. The face of hopelessness is one you can never forget -- whether in Africa or in your own backyard. It should paralyze us, then precipitate action, informed by a plan -- and not incessant talk. If we can ever elevate the strengthening and empowering our First Nations communities to national priority status, we would likely be able to add even more Canadians to the list of people who are lauded for impacting others because of their generosity. It is possible to write a new, more hopeful story for our founding fathers. We all have a part to play in that chapter.